OAK RIDGE, Tenn., Sept. 23, 2015—A research demonstration unveiled today at the Department of Energy’s Oak Ridge National Laboratory combines clean energy technologies into a 3D-printed building and vehicle to showcase a new approach to energy use, storage and consumption. The Additive Manufacturing Integrated Energy (AMIE) demonstration, displayed at DOE’s Office of Energy Efficiency and Renewable Energy Industry Day event, is a model for energy-efficient systems that link buildings, vehicles and the grid. An ORNL team worked with industrial partners to manufacture and connect a natural-gas-powered hybrid electric vehicle with a solar-powered building to create an integrated energy system. Power can flow in either direction between the vehicle and building through a lab-developed wireless technology. The approach allows the car to provide supplemental power to the 210-square-foot house when the sun is not shining. Watch an animation of the energy flow here: https://youtu.be/afITvjudnoc. 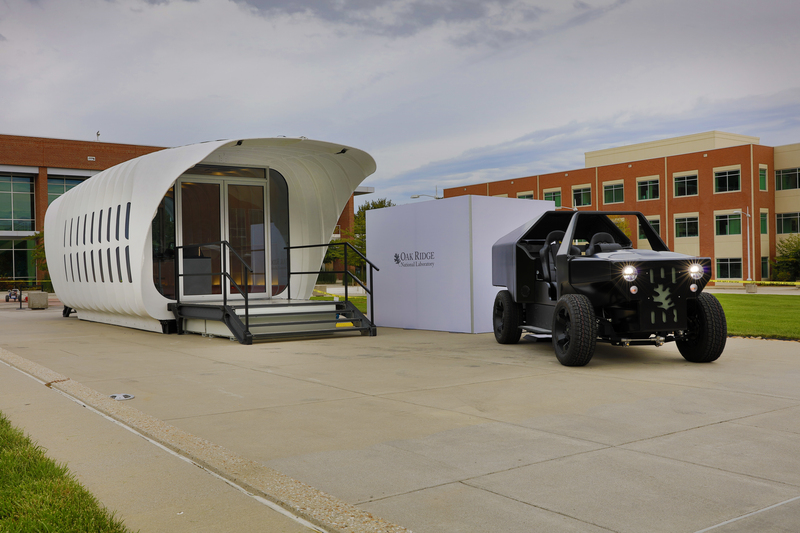 The demonstration also showcases additive manufacturing's rapid prototyping potential in architecture and vehicle design; the car and house both were built using large-scale 3D printers. The 38x12x13-foot building was designed by architecture firm Skidmore, Owings, and Merrill (SOM) through the University of Tennessee-ORNL Governor’s Chair for Energy and Urbanism. It was assembled by Clayton Homes, the nation’s largest builder of manufactured housing. Connecting the house to the 3D-printed vehicle demonstrates the concept of integrating two energy streams, buildings and transportation, which typically operate independently. Advanced building controls and power management maximize the efficiency of the system's components. The project’s energy control center manages the system’s electrical demand and load by balancing the intermittent power from the building’s 3.2-kilowatt solar array with supplemental power from the vehicle. ORNL researchers hope their integrated approach to energy generation, storage and consumption will introduce solutions for the modern electric grid, which faces challenges ranging from extreme weather events to how best to incorporate growing renewable energy use, particularly as the transportation sector transitions away from fossil fuels. Partners on the project are: Alcoa/Kawneer; Clayton Homes; Cincinnati Incorporated; DowAksa; EPB; GE Appliances; Hexagon Lincoln; the Institute for Advanced Composite Manufacturing Innovation; Johnson Controls; Knoxville Utilities Board; Liberty Utilities; Line-X; Mach Fuels; NanoPore; Skidmore, Owings & Merrill LLP; Spiers New Technologies; Techmer ES; Tru-Design; and the University of Tennessee’s College of Architecture and Design. Support for the project was provided by ORNL’s Laboratory Directed Research and Development program and through collaboration among the Energy Department’s Building Technologies Office, Advanced Manufacturing Office and Vehicle Technologies Office. The project also used resources at ORNL’s Building Technologies Research and Integration Center, Manufacturing Demonstration Facility and National Transportation Research Center. High-resolution photos of the AMIE demonstration are available here: https://www.flickr.com/photos/oakridgelab/albums/72157658718524166. Watch a video of the AMIE demonstration here: https://youtu.be/RCkQBlFJRN4. ORNL is managed by UT-Battelle for the Department of Energy's Office of Science. DOE's Office of Science is the single largest supporter of basic research in the physical sciences in the United States, and is working to address some of the most pressing challenges of our time. For more information, please visit science.energy.gov.